So why this fascination of a threatening potential apocalypse that will never come to be? Dr. Baker suggested that, in these stories, humans could be the real monsters and that our fascination, as consumers of this form of entertainment, is due to our attempt to understand the nature and limits of humanity. 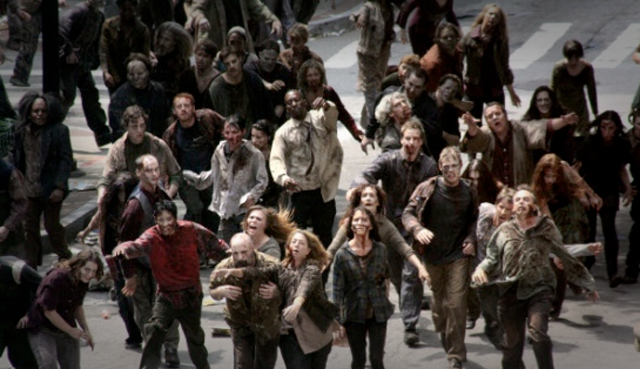 In stories such as The Walking Dead, zombies, or “walkers,” are reanimated corpses that feed on human flesh. This story makes it simple to focus on the remaining humans and what they consider to be right and just. For example, the first season of The Walking Dead focused on killing zombies versus killing humans. The lead character Rick insisted regularly that he and the other humans he was with would not kill other living people. Of course, that view eventually had to change because the characters encountered violence with other humans, leading to deeper questions about human morality. This added a deeper complexity, forcing the audience to ask if Rick’s actions were cruel or just at every instance. These are not the only questions that zombie stories raise, however. Stories such as Warm Bodies bring the audience back to questions of morality in regards to zombies themselves. In this story, there are two types of zombies: those called corpses that still think and feel, but cannot remember why they did certain things in the past, and those called bonies that no longer feel and exist only to kill and eat. Through the course of the story, the humans learn that the corpses can become human again. The human Julie is a part of a safe house of other humans who are fighting off the zombies. She meets and eventually falls in love with a corpse called R. Julie’s father wants to kill R until the humans learn that corpses are capable of regaining human life. At the end of the film, the humans and the corpses join forces to kill off the remaining bonies. The questions of morality that are raised then are not about whether or not it is right to kill to save others, as in The Walking Dead, but rather whether or not it is right to kill at all. By having the humans and corpses fight the bonies together, this movie asks the audience to understand that it is only right to kill if what is being killed has no chance of having the same sense of morality. These questions of morality certainly say some interesting things about humanity. Zombie stories such as these ask the audience to ask questions that are not new. Questions about killing others have been around since the days of Cain and Abel. It seems that zombie apocalypses are just the latest setting in which to explore these questions. These are questions that can be raised in many contexts. Zombies are just a fun way to do it. Of course, they prompt further questions: is Dr. Baker right in saying that humans are the real monsters in these stories? What other existential questions about humanity do zombie stories raise? And where else do we see these sorts of questions explored? This entry was posted in Relevance of Humanities, Religion in Culture, Student Blog and tagged Kelly Baker, Morality, Sarah Griswold, The Walking Dead, Warm Bodies, Zombies by admin. Bookmark the permalink.